By the middle of the 19th century, Litchfield had evolved from a bustling commercial center into a pastoral hilltop town. With the closest railroad station seven miles away, industrial efforts had moved to Torrington, Winsted, and Waterbury along the Naugatuck River. The majority of the 3,200 residents ran small agricultural and dairy farms or operated shops along West Street. Old photographs from the time show clapboard buildings along wide dusty roads. The names on many of the shop signs trace back to the founding families of Litchfield. The peace of this historic community was shattered with the tumultuous start of the Civil War. Residents’ sentiments varied about the war. Some advocated for peace and were quickly labeled “secessioners” or “copperheads,” terms used to label Northerners with pro-Southern sympathies. Their arguments for a peaceful solution to the conflict were anathema to the majority, who quickly denounced any dissenting opinion as unpatriotic and traitorous. Tempers flared in August 1861 when a white flag symbolizing opposition to the war was spotted hanging outside the home of Andrew Palmer, just north of Litchfield in Goshen. An elected group of five men spoke with Palmer about lowering the flag. Their efforts proved to be in vain, as the flag reappeared the next morning. 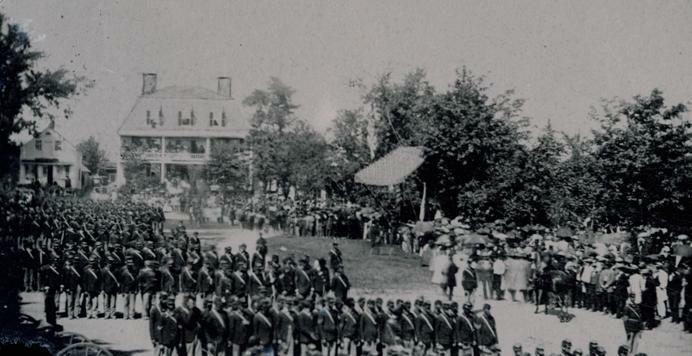 According to the Litchfield Enquirer, a group of 100 men assembled in front of the Congregational Church in Goshen and marched toward the Palmer property. Palmer removed the flag before the mob arrived. The crowd demanded the flag be turned over but Palmer refused and was arrested. He was taken before a local justice of the peace and signed an oath promising to refrain from flying any more peace flags in the future. To address the problems of war dissent, on September 1, 1861, Governor William Buckingham issued a proclamation outlawing the display of peace flags. Townspeople responded by forming the Litchfield Vigilance Committee, which appears to have consisted of rowdy young men who used the veil of the committee to intimidate residents they viewed as unpatriotic. One incident recounted by Esther Thompson, then 10 years old, involved the Palmers (no direct relation to Andrew Palmer), an elderly couple from Litchfield. According to Thompson, Mr. Palmer was an outspoken “copperhead.” One night a group of 40 to 50 men tacked an US flag to the front of the Palmer house and then bullied the Palmers into signing an oath of allegiance. Even the most prominent of Litchfield’s citizens was not free from scrutiny. In an incident that garnered statewide media attention, Dr. Josiah Beckwith, a well-respected medical physician of Litchfield and acting president of the Connecticut State Medical Society, was accused of providing drafted soldiers with medical exemptions from military duty in exchange for money. He answered his accusers in an editorial in the Litchfield Enquirer, stating, “we regard it a solemn and responsible duty which devolves on military surgeons, to muster none but proper men into the Federal Service . . . the reports of Hospital Surgeons and the medical press have shown the disasters which have resulted from mustering men having ‘Hernia, Varcicle, [sic] Heart and Chest diseases.’” Though no criminal charges were brought against Beckwith, his participation in the medical screening of military soldiers was suspended by the United State Surgeon General in August 1862. Articles in the Litchfield Enquirer, which from June 27, 1861, to February 13, 1862, had closely monitored and denounced the peace movement in the county, suddenly stopped appearing. From then on, the town maintained a united front in favor of the war. The mythology of the Civil War holds that citizens of the North were uniformly pro-Union. History reveals a different story. 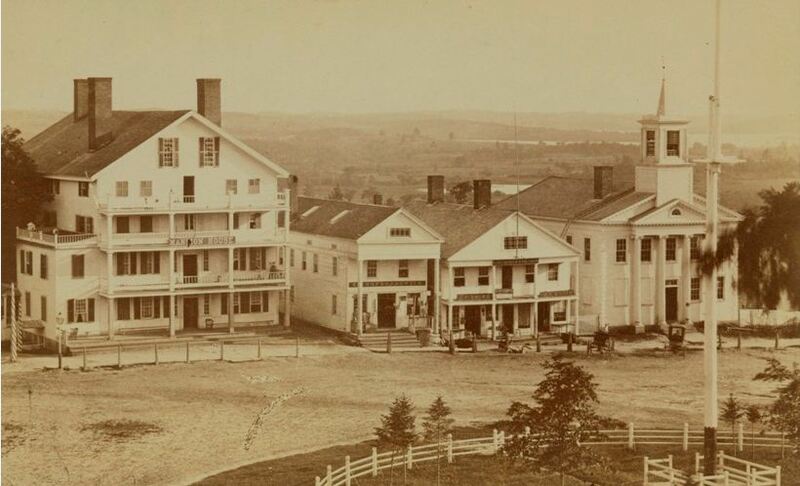 While the peace movement in Litchfield may have been short-lived, it provides an important reminder of the disparity in public opinion during the first few turbulent months of the Civil War. 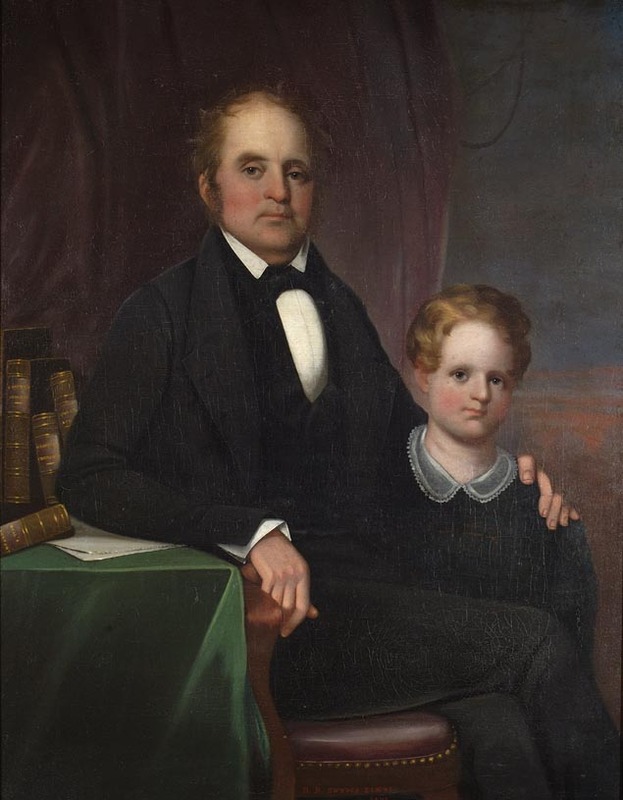 Julie Frey Leone, curator of collections at the Litchfield Historical Society, helped create The Ledger, an on-line, searchable database of the students who attended the Litchfield Law School (1784-1830) and Litchfield Female Academy (1792-1833). “Hervey Brooks Pottery Collection.” The Litchfield Historical Society, 2016. Link. “Newspapers of Connecticut - Digital Database.” Connecticut State Library, 2016. Link.